Google tells me that a lot of people come to Yo searching for info on SoNo. Smithfield‘s 27-story tower, located at 860 W Blackhawk St on the Near North Side, often comes up in conversations about price cuts at new-construction developments, due in part to @properties‘ aggressive promotions over the past year. For whatever reason, we’ve never had a lot of luck in our efforts to cover SoNo, but there’s enough info floating around out there to give you a pretty good indication of where things stand, sales-wise. Way, way back in the day, SoNo’s one- to three-bedrooms were priced from the $270s to $570s. According to Redfin‘s sales records (which aren’t comprehensive, mind you), 115 of SoNo’s 200 homes have closed since December 2008, including one-bedrooms with 788 to 1,196 square feet selling from the $240s to $400s, two-bedrooms with 1,416 to 1,436 square feet selling from the $390s to the $630s, and a couple of three-bedrooms with 1,656 square feet selling in the $480s and $490s. One 2,200 square-foot unit, presumably a combo unit, has also sold for $700,000. At least four homes are under contract, according to Redfin. Since @properties chooses not to list all available units at its large, new-construction projects, it’s not easy to gauge a full price range for SoNo’s 80 or so unsold homes from the MLS alone. The 13 condos currently listed range from a one-bedroom with 796 square feet, priced in the $250s, to a two-bedroom with 1,436 square feet, priced in the $440s. Estimated monthly assessments on these homes run from around $330 to close to $500 per plan. A couple of closed one-bedrooms are also available to lease for about $2,000 a month. SoNo was advertising 3.99% financing a couple of weeks back in the RedEye. They might be moving units again with those rates. Does this also mean possible price cuts in the future if units aren’t moving with the bought down financing? Does anyone know if they are still planning on building “tower 2” and making that a “rental only” building? I wouldn’t hold my breath, Morgan. It may still be on the table as a long-term goal, but it’s not getting any easier to build high-rises. I would say that SoNo is not a great location for a highrise. The views should be pretty good with few other tall buildings in the area, and the finished appear decent. The problem is that area is a nightmare for both cars and pedestrians. A lot of strip mall type shopping and mega retail like Best Buy. With the closest other highrise, being a a cabrini tower – someone should of saw this coming sooner. Wait for the prices to drop. Actually, with 20% down, their buying out the interest rate on the 2 BR to 3.825. Not sure what all the fuss is about traffic, all the problem areas seem to be located within a few blocks of SoNo. So what, are we talking an extra 5 minute commute???? Here is some more information on SoNo from @properties, the exclusive sales & marketing agent for the building. SoNo is just under 70% sold. This figure is based on solid contracts that either have closed or will close in the next 60 days. The 3.99% interest rate is available with 10% down and no PMI. Other options are available as well. Since a re-pricing of the development last year, prices have actually gone up at SoNo in response to demand. There are no plans for further price reductions. Is that a fixed interest rate? I’m wondering if the Cabrini Green towers are going to fall before the SoNo prices. I believe all the discounted rates are 30 year fixed, which is a pretty good deal. The location is great if you’re walking to everything, but driving around could get old pretty fast. I invite you to come to SoNo. 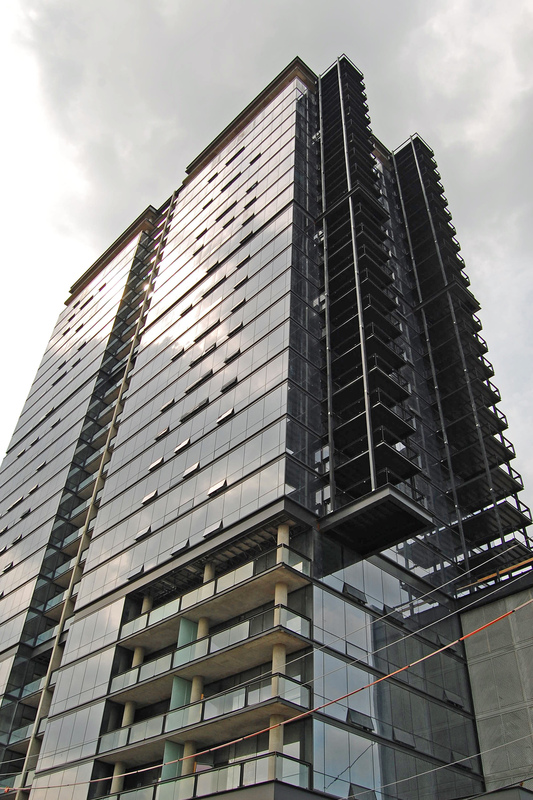 With only 37 units left unsold, the building has an energy like no other. We just turned over from our developer to our own HOA. I think you will like what you see and why SoNo is “the” place to live in Lincoln Park. Pet friendly, kid friendly, people friendly and who needs a car! Join us on Weds. August 25th when our featured artist David Zhou discussed why he and his brother were chosen for SoNo. The public is welcome. As an owner, how do I send you photos? We love to do video interviews with owners about their experience, Kim. E-mail me at yojoe at yochicago dot com and I’d be happy to set up a time with you. In the interim I’m nursing a strong suspicion that you’re not an owner, but someone involved in the sales and marketing of the building. I will back up that Kim is not a marketer. She is the owner of a 2bed/2ba unit and so am I (we live on the same floor at SoNo). Kim is exceptionally motivated and has taken charge of the daunting tasks of organizing a HOA from scratch and I would call her the “founding” member of our new board. By the way, I also tried to get Sabrina to do an update on CribChatter a few months back but something tells me it ain’t the same Sabrina anymore… (hint hint). Thanks for the info and the hint. I took a brief look at CribChatter and it appears that there’s a replacement or a supplementary Sabrina in the crib. The new Sabrina has a much looser grasp of the English language than the previous one. Some of his / her dangling modifiers are downright howlers. Has the new Sabrina been offshored by whoever owns CribChatter? It also appears that the Sabrinae (Latin plural of Sabrina) are morphing the personas of some of their fictional commenters, much as the various Carolyn Keenes evolved Nancy Drew over time. Thanks Ryan. I can’t wait for Joe’s arrival.